As someone who played the sport pretty much year-round from age 10 until I graduated high school, you could say I was a wee bit obsessed. I came thisclose to convincing myself to play at the college level too. I ultimately chickened out of what I deemed too much of a commitment and ran track instead, but our intramural basketball team was awesome--four-time champs! I found that I couldn't help but stay involved with the sport, and actually filmed the men's games for a couple of seasons. To this day, I still love watching college ball, and I definitely get into the tournaments. Last year, my fiance's family did a bracket competition, and I finished second, that grand prize of an iTunes gift card just beyond my reach (my fiance won it...). It just doesn't make sense to watch a basketball game (or four in a row) without some easy foods on which to munch, and Cheez-It Crackers are an ideal snack for game day! Not only are they tasty straight out of the box, but they also lend themselves to many applications as an ingredient as well. Yes, you can crush them up to make a coating for chicken fingers or a topping for a casserole, but you can also bring them more front and center, like with this cheesy cheezy Cheez-It toffee. The toffee, which is based on the fantastic recipe from my all-time most popular post, is little labor-intensive, but the pay-off is HUGE. What a delightful combination of sweet, salty, and spicy! With all Cheez-It Baked Snacks, real cheese is key, and you can taste the difference the use of real cheese makes in their products. I know you have a Target somewhere relatively close to your home and/or workplace, so be sure to pop by and pick up some Cheez-Its for all of your munching-while-game-watching needs. Large boxes of Cheez-It products are 3 for $8 the 3rd week of February through the 1st week of April, and these products are generally found in the Signal the Seasons Savor Spot section or near the Check Lane, so be on the lookout. Line a 15x10-inch jelly roll pan or a 12x17-inch cookie sheet with foil and spray with non-stick spray. Lay a flat layer of crackers out on the foil. Measure out your morsels and set them aside. Now you're ready to melt the brown sugar and butter until a boil is reached. Reduce the heat and simmer, uncovered, for 5-6 minutes or until mixture is thickened and sugar is completely dissolved. It should be pretty thick, but thin enough to pour and spread on its own. Pour this mixture over the crackers and make sure all are coated fairly evenly. Bake for 8-10 minutes, or until the toffee becomes completely bubbly. After removing the pan from the oven, let it sit for 3-5 minutes and begin to set up. Sprinkle on the chips, let them soften and melt for about 5 minutes, and then spread them into an even layer. You can sprinkle on nuts, cracker crumbs, or whatever else floats your boat at this point. Let cool and, if desired for expediting purposes, refrigerate until hardened. Break into pieces the size of your choice and enjoy! Place crackers on a cookie sheet lined with foil. Microwave sugar and butter for 4 minutes. Whisk to blend. Pour over crackers and bake at 350 degrees F for 15 minutes and continue on with recipe above. If you love sweepstakes and winning as much as I do, you should check out the Cheez-It Munch Mania Sweepstakes. 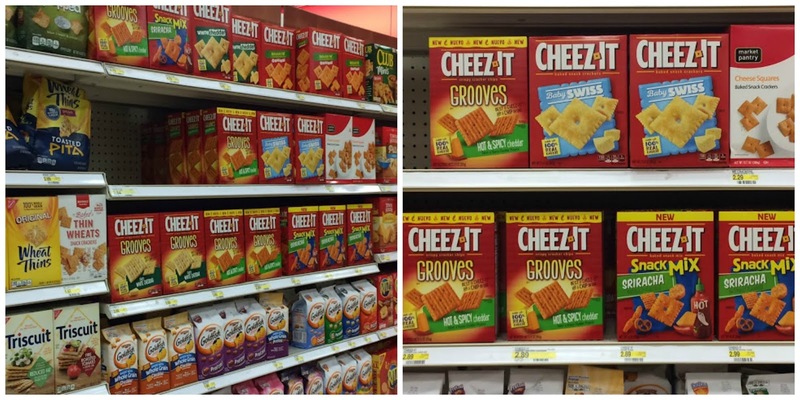 Follow Cheez-It on Twitter and Facebook for more information about all of their wonderful products! My father dragged us all over the state to basketball games. If I never see another one, it will be fine with me! Football and hockey I love! Cute idea with the chocolate and cheese-its. Love that spicy/sweet combo! Out of all the sweet and salty combos I have tried - and I've tried a lot - it never occurred to me to try Cheez-Its. But this looks positively addictive! These look seriously delicious and addictive! I could eat a whole isle of these cuties! I am glad I don't have them in front of me right now!I am starving! I'm delightfully surprised to learn of your basketball obsession Grace. I'm not much of a basketball fan but boy oh boy, my son most certainly is a huge fan. He played during his school years too. He contemplated playing in college but decided against it. I'm sure he would love this recipe. He's always looking for munchies to watch the games. I may just surprise him with some Cheez-It Toffee since I have plans to go to Target before the week's end. Basketball is my favorite sport to watch. This toffee is killer! I love the spicy crackers with the sweet and salty toppings. You are a rock star Grace! Hi Grace, I used to play basketball in high school and one day during a game ran the wrong way with the ball and thank goodness missed the hoop. Yikes I was bad. Anyway I bet this is delicious with the sweet and salty flavors going on. Great post!! Do you have a systematic way of finding food related contests? I saw you share these on instagram before we headed off on our little mini-vaca. So glad you shared the recipe! The perfect snack! These look crazy addictive! I love the sweet, spicy, salty combo.